" The small things really count with friends. Even a little smile can make a big difference. " Corrin is on the taller side, and slim. She's decidedly feminine, with a round, innocent-looking face that makes her seem just a little younger than she actually is. She has an old, rather faded scar across her nose from sometime in her early childhood, but she can't remember what she did to earn it. She doesn't think it had anything to do with a fight. She definitely doesn't look like much of a fighter, despite her occasional claims that she can handle herself. She has long, thick, wavy hair that's somewhere in between light brown and dark blonde, and she refuses to tie it back. Does it get in her way? She doesn't care. She likes it that way. The only nod she makes to practicality is a dark headband, and even that doesn't do much. She tends to wear darker, neutral colors, though she has a clear fondness for blue. She tends to wear pants, though will wear dresses when she doesn't feel a need for practicality. Of particular note is the fact that she generally refuses to wear shoes. She feels they constrict her feet too much, no matter how loosely fitted they are, and only wears them in the winter to protect herself from frostbite, as she acknowledges that frostbite is worse than shoes. 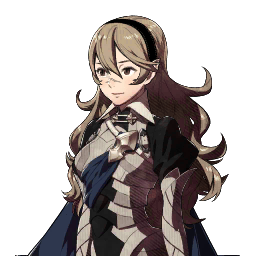 Foremost in most people's perceptions of Corrin is her almost childlike naïvete. She trusts just about everyone she meets immediately, strongly values kindness, and makes friends easily. She has a hard time thinking ill of anyone, even her father. She's quite huggy, and finds touch to be an important part of relationships with others. This is probably Camilla's influence, at least in part. She doesn't want to stand against the ones she loves in any way, and while not exactly a yes man, she does want to please the people around her. She's always been close to her siblings—that is, the siblings she was raised most of her life with—and is especially close with her two sisters. However, she doesn't see her biological family as being family, and doesn't completely believe that she's even related to them at all. She's wary of Ryoma and his intentions, though she regrets that she can't bring herself to trust him as she does everyone else. She's extremely determined, and can be very stubborn so long as it doesn't conflict with the people she loves. She's often pretty hard on herself, especially when it comes to remembering things, as she's convinced that she has a poor memory (though in truth it's pretty average). She still feels some regret over the fact that she can't remember much anything from before she was five, and can get pretty quiet when others are discussing what they were like as small children. However, Corrin's greatest regret is a secret that she has kept fiercely guarded, even from the family that she loves: she thinks she should have been a dragon. Not just that she wants to be one, though she does wish she was, but that she should be. Her every glimpse at the sky is tinged with sadness at the realization that she'll never have wings to spread to fly. It's also why she isn't especially enthusiastic about being a Candidate: being bonded to a dragon could never be enough. It wouldn't be the same as being one. Corrin was born at a Fortian cothold, which for some reason was rather embroiled in a feud with one in High Reaches. She didn't really care; she was only a young child, and it didn't affect her. All she knew was that she liked playing with her siblings. Until one day, the two holds decided to try to reconcile their differences, and Corrin went with her father to visit the hold in High Reaches. Only it was never a diplomatic visit, but an assassination: Corrin's father was killed, and she was kept by the other hold and raised as their daughter. She fought against it at first, but in time the memories of her early childhood faded away, until she was fully convinced that she was actually Garon's daughter. She didn't have another family; they were her family. She has always a bit disappointed that she couldn't remember her early Turns, but it was never a major concern, just a minor point of awkwardness. For the most part, she was kept isolated, save from her own family, and was never allowed to leave the cothold at all, barely even allowed outdoors for more than a few minutes, and never out of her father's sight. She was told that it was for her own safety, and she believed it. She resented it a bit, but she believed it, and obeyed. She was told her siblings might be hurt if she left, and this too she believed. She knew what was happening to them, even if she was mostly spared from it. When she was nine, Camilla was Searched, which she wasn't particularly happy about, since she knew there was no way she'd ever be allowed to visit her sister. And it was true: save for the rare occasions when her sister visited, she didn't really get to see her at all any more. Things continued for Turns in which she was vaguely bored and frustrated that she couldn't leave. Not that she wanted to leave her family, but she wanted to see other places. See dragons, even if seeing what she couldn't be would hurt. Until one day, a man named Ryoma showed up, claiming to be her sibling. Her real sibling. For the first time, Corrin found herself in a situation where she didn't believe someone. Because it couldn't be true; Xander and Leo, Camilla and Elise, they were her siblings. She couldn't understand why he was trying to claim such a hurtful thing. What had she ever done to him? But before things could escalate any further, a searchrider showed up, wanting to take her, Leo, and Elise all. Corrin agreed, not because she really wanted it, but because Xander wanted it for her. She knew it would never be enough, but he couldn't know that. If leaving him behind would make him happy, well, she'd do it, even if it hurt her. So she came to High Reaches as a Candidate, uncertain what her future might hold. Becomes involved in an altercation between her father and Xander; completely loses control and goes berserk. Has discovered that she's now scared of what she might do when violence comes up. Smooth and rounded in all her lines, Astralaeth looks eminently feminine, with a curved form that might look adorably chubby on a different dragon. On her, however, the layer of fat over her muscles makes her look disarmingly gentle, as if she would be comfortable to sleep against, or a soft and delicate lady. 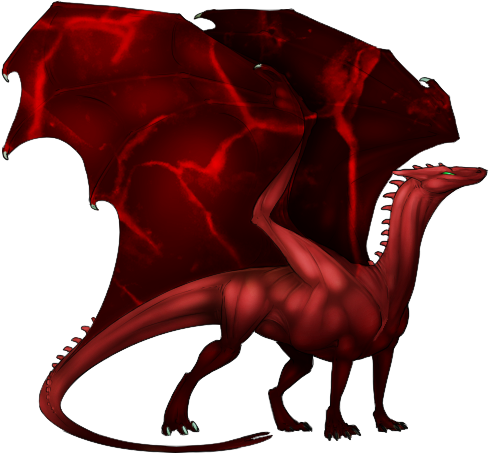 Instead, the muscles beneath her skin make her powerful, with the weight and force in flight of a dragon far larger than she, and with the ability to carry more passengers or cargo than could be expected of a dragon her size. While she might not be strictly elegant or agile in the air, Astralaeth is a capable flier, and a stunning streak of bloody red in her swift soars and powerful stooping dives. Dark maroon in her main color, in places Astralaeth's hide pales almost to a deep rose color across her topline and haunches, as if she has faded in the sun like a rich red garment left to dry too long on the clothesline. But the color is natural, and it gives the illusion that Astralaeth is always standing under the light, even when illuminated only by glows or starlight. Her wings, however, carry none of the faded color, remaining rich maroon throughout, shot through with streaks of crimson, like the veins of marble, giving her an almost martial or violent appearance when she spreads her wide wings to their full extent, as if she wore a bloodied cape over her sun-bleached garnet hide. Her voice is soft and well-spoken, but echoes lightly in the mind. Astralaeth is by far the spookiest and strangest garnet to be born recently. There is something haunting about her; she lingers in the mind long after you are done interacting with her. She has an almost sorrowful feeling that seems to surround her, despite the fact that she is kind, charming, and polite to all she meets. She has many deep thoughts, often taking her time to respond to something to make sure she's figured out exactly what she wants to say and has thought all possibilities out that she can. She is also immune to compulsion, something she doesn't readily share with anyone unless necessary. She is very accepting of the nature of death, finding it to be an important lesson that too many run away from. To her, its a subject she chooses to be well-versed in; she spends time around the dying as much as she can to ease their parting and to make sure they know they will not be forgotten. She will work with her rider to remember those who are gone. She's not afraid of violence as a whole, knowing it too has a place in society and life, even if it is a subject that should be minimized unless necessary. And she is a very sacrificial creature; in her moment, she knows she is not afraid of death, and should the opportunity to save another arise, she gladly jumps to assist and save as much as she can. Pachelbel is a bright, orangey gold, very much the 'classical' example of her color. 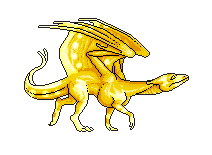 Her wings are edged with a band of brighter yellow-gold, and there are also dots just in front of that band, mirrored in a line of dots running down her tail and little booties on her legs. However, she's rather on the small side, and incredibly clumsy; there's not a regal bone in her body, and it definitely shows as soon as she moves. Pachelbel is, bless her little heart, not really the brightest of fire lizards. The world at large seems to mostly confuse her; why are people so big? Why is that blanket that she dove into now around her? Why do people keep on saying 'Pachelbel' around her? She's sweet, and she tries, but she's honestly just not very smart. She loves her person, and her person's dragon, even if she doesn't quite seem to realize that Astralaeth is a living creature rather than a piece of furniture that is warm and often moves. She's usually startled when the garnet tries to speak to her, and in such cases will generally try to hide in her person's hair. She never seems to figure out that this is how she gets tangled in said hair.